Not magazine to reader; or RSS feed to target audience; or newsletter to subscriber; not the expected to the expected. Not a product that is 1% different than the competitor, and 1% different than what hasn’t been working for the past 5 years. The medium is not the message. Content is not king. Solutions are king. The brand that more keenly identifies gaps in what is being offered to their market, and which needs of their audience are goin unfulfilled – that brand is the one with a true opportunity. The brand that exploits this gap – that brand has a strong future. This is what investment bankers do: exploit gaps in the market. My friend Donna Flagg shares an interesting story of young Wall Street analysts’ ability to spot loopholes. Of course, when investment bankers’ efforts DON’T work, is when they focus less on research, less on analysis, and more on what makes them fit in to the trends in the market. This week’s New Yorker featured an article challenging the assumption that entrepreneurs follow a risky path. In it, they detailed why the banking crisis occurred: "As long as the music is playing, you’ve got to get up and dance," the now departed C.E.O. of Citigroup Charles Prince, notoriously said, as his company continued to pile on dubious investment on another. He was more afraid of being a wallflower than he was of imperiling his firm." As the New Yorker article stated, entrepreneurial success is not about taking a crazy risk. In fact, those are the entrepreneurs that usually fail. Success is about doing more homework than the competition – by a WIDE margin; by analyzing the market again and again until an opportunity clearly presents itself. It is about moving forward with a wild idea only when you are sure that you have exposed a gap that is critical, but no one else has noticed. As we experience the doldrums of the media world, one needs to look past commonly held assumptions. To challenge. Not for the sake of being weird or different, but to focus intently on the needs that others are failing to provide. Look beyond known roles. Look beyond existing products. Look beyond what everyone else is talking about. 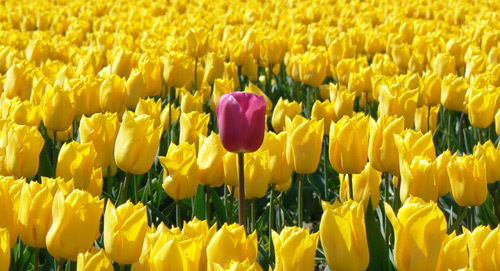 It is uncomfortable to go against the grain – to be different. Everything about our culture punishes it – pushes you down for even considering it. Every day, I hear more news about how media (consumer and business) is shifting. Every day. Here is today’s example from Meredith. What is there to loose by doing something different? Making a "safe" decision is sometimes not safe at all – it is merely the "expected" decision. In an unprecedented cultural shift, you can’t solve tomorrow’s problems with yesterday’s solutions. Is a new tablet eReader that makes magazines fun again going to save B2B media? No, it won’t. The technology is not the problem. NEEDS are the problem. Solve the needs of those in your market – be it by article, directory, webcast, training, event, service, etc. That is what will make you indispensable. Flat is not the new up. Flat is not a goal. Flat is giving in. Solutions are the new up. Not conforming is NOT an argument against best practices, templates, or established processes. What is important is how one uses them as a means to an end – not a goal unto itself. The goal is to focus on fulfilling needs, not to fall safely into an established process that gives one the comfort of saying: "I’m doing my job, if things aren’t working, its not my fault." The counter-argument to all of this is: ‘but I am a journalist; I am a copy editor; I am graphic designer.’ The implication being that their role, and the role of media is clearly defined, and does not include anything other than creating content, putting ads next to it, and sharing it with a target audience. But these roles are a choice. Not a choice of ‘yes’ or ‘no,’ but of how someone wants to shape that role. Consider anyone you look up to. Your heroes. Perhaps it’s a sports star, a grandparent, a political leader, an artist, a musician, a humanitarian, a philosopher, a scientist, an inventor, a writer, or comic book character. You can clearly define them in one or two words as I just did. And yet, they destroyed the boundaries of how that role is commonly defined. They challenged the limits, broke the mold, gave more than they needed to, pushed farther than anyone thought possible. They didn’t conform. Because if they did, they would do exactly as expected, and nothing more. They would be middling. They would know when to stop, know when they threatened others by coming up with a brilliant idea, know when they risked social standing for a shot at real achievement. Ten years from now, when the world looks back on the shift in media, there will be heroes. There will be names of people who broke the mold, who ignored the trends, and who created something of incredible value. These people are among us. These people are you. Make that choice to not conform, to do the unexpected, to get closer to the markets you serve and find the problems they don’t even know they have. Then, focus intently on creating one thing: a solution.